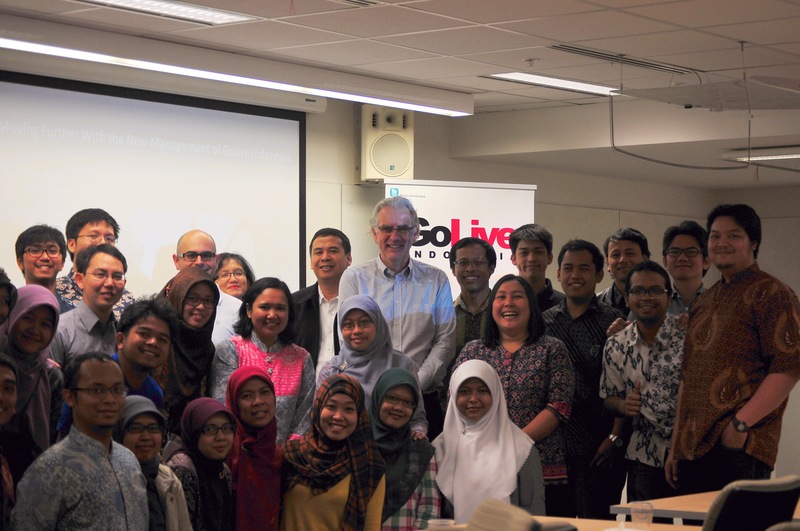 Golive Indonesia, in collaboration with PPIA-SA, has successfully organized the discussion series on 7th November 2014 with the theme of “The Heralds of Indonesia’s New Government: Economy and Foreign Policy Issues”. The discussion was moderated by Dr. Risti Permani (lecturer & researcher at Global Food Studies University of Adelaide), and presented the key speakers Dr. Nunung Nuryartono (Lecturer at Bogor agricultural University – Indonesia) and Muhammad Taufan SH, LL.M (PhD candidate of School of Law at Flinders University). There were more than 30 participants attending the even. The participants are all students and academia coming from all three South Australia Universities including Associate Professor Veronica Soebarto as a member of The Indonesia Advisory Board at The University of Adelaide. Professor Christopher Findlay (the Dean of the Faculty of Profession University of Adelaide), gave his opening remark speech, emphasizing several points for the development of GoLive Indonesia. He hoped that GoLive Indonesia can be a model of distributing knowledge, ideas, and work regarding current event or issues in Indonesia and able to contribute in the problem solving. Thus, it is strongly suggested that GoLive Indonesia could create a good network with similar organizations or communities in Indonesia as well as in Australia. Prof. Findlay also highlighted the importance of organizing a meeting & physical event in addition to blog-based & social media activities for achieving GoLive Indonesia’s goals. • Based on ADP report: Indonesia will become one of 11 countries that might be trapped in middle income country. • Demography Bonus (DB). DB will not automatically benefit Indonesian welfare if the government cannot create the right policies. • New government roles with the priority to increase the quality of life and economical independency by optimizing strategic economic sectors such as agriculture. For further information, you can download the presentation GoLive_Discussion-Series_Economy_Policy_Issues. Muhammad Taufan SH, LL.M delivered his presentation on a title “Foreign Policy in Indonesia’s New Administration”. He stated that under SBY’s administration, Indonesia has become one of emerging power countries with important and strong economic performance, playing all directions diplomacy, and consolidated foreign policy-making. • Citizen Protection: to protect Indonesia workers (skilled and most importantly unskilled worker) in foreign countries. • Global Matiritime Axis: Global cooperation on marine environment, Initiating international legal and trade system against IUU Fishing and other ocean illegal products, development of sea infrastructure and network such as port, cable, pipeline and ship. For further information, you can download the presentation GoLive_Discussion_Series_Foreign_Policy_Issues. In Q & A session, the participants actively expressed their opinions, views, and questions as well. There are several points arisen from the discussion. Karim Abdullah questioned the competency of new government’s economic team and their commitment in continuing & implementing the Masterplan for Acceleration and Expansion of Indonesia’s Economic Development (MP3EI), which has been set up by the SBY’s government. Dr. Nunung Nuryartono expressed his disagreement on the MP3EI because it seemed that the master plan did not well-implemented. He highlighted that the most important thing is not to rely on the government so much but we must be able to bring positive contribution to our country, starting from ourselves. Wahida brought the issues concerning the foreign policy of each ministry in Indonesia whether they are allowed to decide their own foreign policy or they should have consulted it first with ministry of foreign affair. Mr. Muhammad Taufan SH, LL.M responded that each ministry should be well-coordinated and having intergovernmental agency coordination regarding foreign policy, aligned with the policy of President Jokowi to diminish the ego sectoral interest. Kevin Pantouw raised the concern on the economic impact that might arise if the government decide to reduce the energy subsidy. Dr Nunung viewed that the increasing of fuel price, is estimated will affect the increasing of product price in the market, but the fluctuation will only last for about 3-4 months, and there after the price will be stable. In summary, the challenges & opportunity faced by the new government are evidence. As part of civil society, we are also responsible for the development of Indonesia in the future. Therefore we must assist the work performed by this new government by staying neutral, be critical, and evaluative. Most importantly, quoting from Jokowi’s statement, “we must work, work, and work towards a better Indonesia”.